Disney’s newest attraction in Orlando, Pandora – The World of Avator, opens May 27, 2017. It’s a visually stunning space with two breathtakingly beautiful rides. These Pandora Avatar tips will help you make the most of the experience, including a little warning about those banshees. Animal Kingdom has long been my favorite of the four Disney World theme parks. I love the Expedition Everest roller coaster with its Yeti, but I also love the animals and the environmental message. So I was admittedly a little worried that adding a hot movie-themed section to Animal Kingdom would turn it into just another theme park. 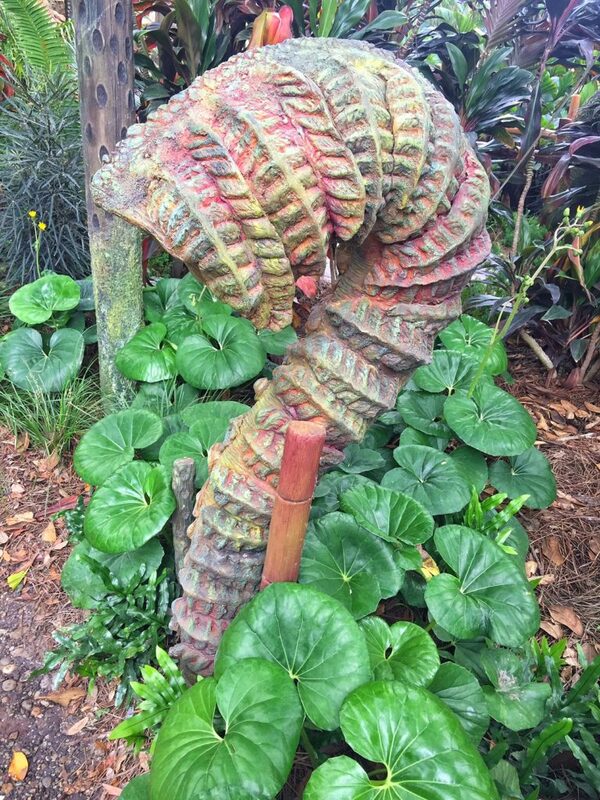 But the world of Pandora integrates nicely with Animal Kingdom—just as real Florida flowers are woven in among the fantastical (and fake) Pandora plants. This long-awaited and much-anticipated new Disney attraction, Pandora – The World of Avatar, is a visually stunning place during the daytime. 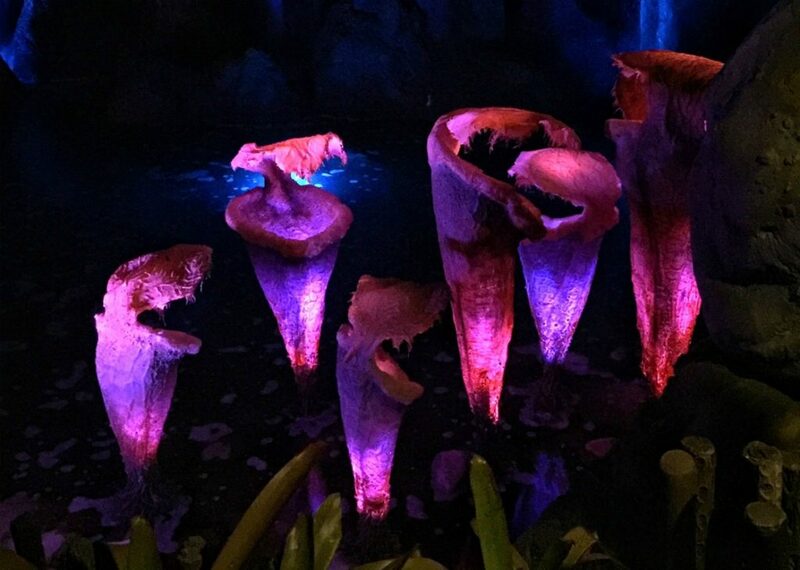 At night, when the bioluminescence should have ratcheted things straight up to the stratosphere just as it does in the onscreen world of Pandora, I was a little underwhelmed. More on that later in this post. As always with Disney, the attention to detail is impressive. For example, every one of the plants that hide the walkway lights in Pandora is different from every other—just like every plant in my garden is different from the next. The area is staffed by ACE employees (ACE stands for Alpha Centauri Expeditions) who will share their knowledge and love of all things Na’Vi with you. All you have to do is ask. I was particularly enthralled with the stories of the flora. There’s the big blue puff ball that absorbs toxins. You’ll be warned not to stand too close. If they absorb too much, they can explode. And there’s a banana fruit tree. There is a complicated ritual around the fruit that falls on the ground, offering it to others and then eating it as a way to bring luck. And finally, there are blue things called bladder polyps. I was not able to learn a reasonable explanation for the unfortunate name. Pandora is a part of Disney. So the story is key. In this case, we find ourselves on Pandora a decade after the time depicted in the 2009 movie. 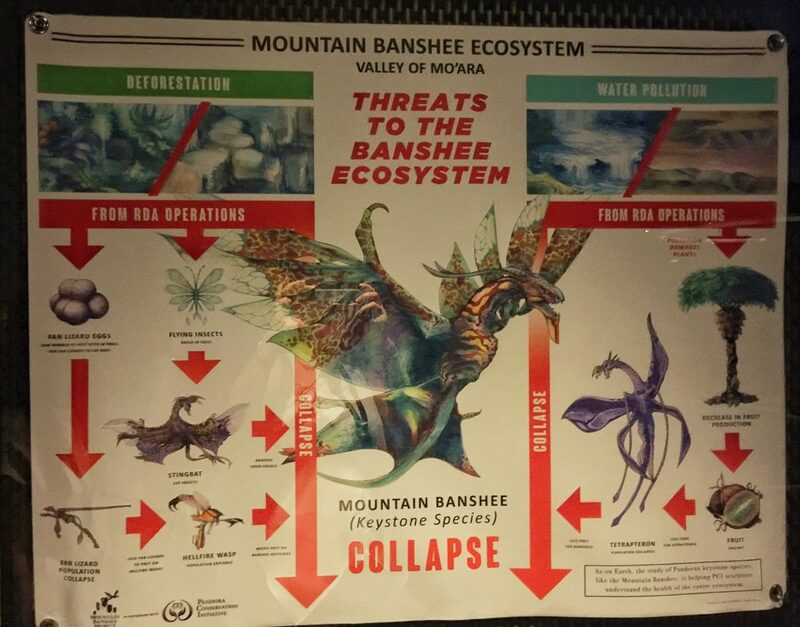 The environment has been devastated and the Na’Vi people and the banshees they ride are in danger. Earthling ex-pats are working to restore their habitat. The “environment” of Pandora responds to human touch. It starts at the beginning, when you encounter a giant “flaska reclinata”—the last of its kind. Visitors can help save the species by rubbing it to release “spores” that will sprinkle the land and (one hopes) grow new flaska reclinata. 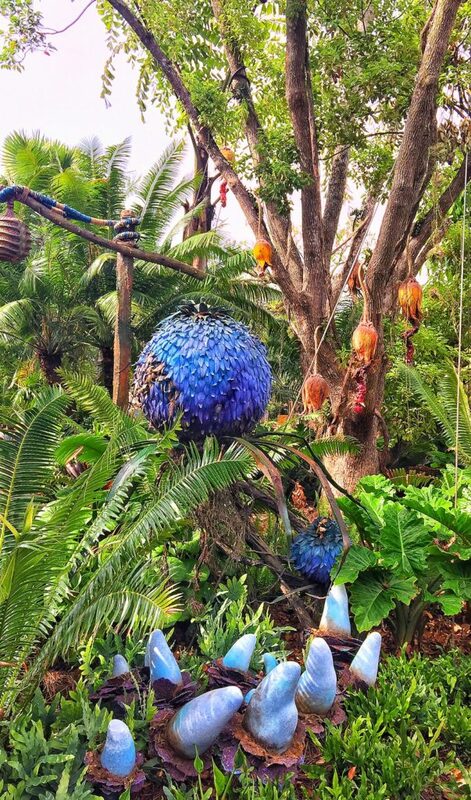 In the heart of Pandora, there are plants that can be played like drums. Truly, my drumming never sounded so good! TravelingMom Tip: On a hot day, ask someone else to rub the flaska reclinata. Then stand near the tip so you can benefit from the “spores” it releases in the form of a nice mist of cooling water! TravelingMom Tip: This is where you want to book your Fastpasses. It will be months before interest in Pandora falls back to normal levels. Wait times in the standby line could be as long as four hours! If you are particularly impatient, you have the option of springing for the VIP experience—a couple hundred bucks per person (ages 9 and up) on top of the ticket prices lets you cut the line on rides. This is the more sedate of the two rides. We climbed into small boats with just two rows of seats. The boats easily fit three to a row, four if necessary. 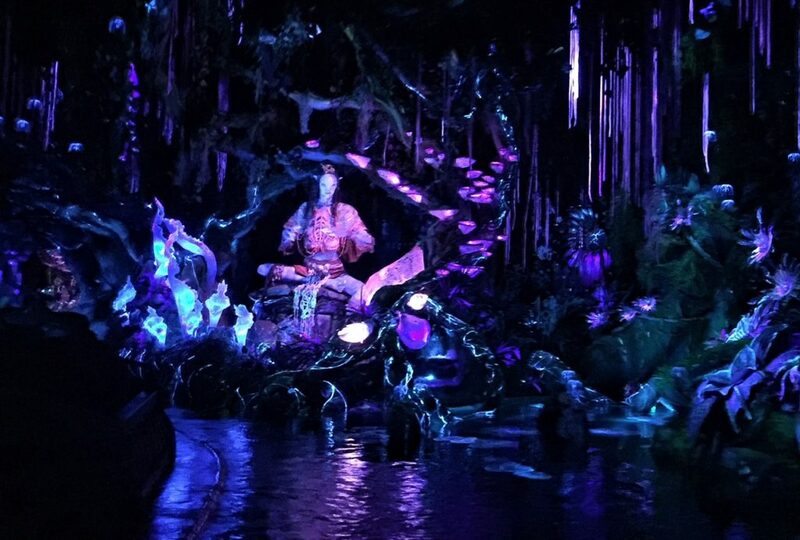 The boats float through the river of Pandora, surrounded by glowing bioluminescent vistas. Presiding over the end of the ride is an animatronic Na’Vi shaman woman. She sings and moves better than any other robotic character I’ve seen at Disney. It’s possible the standby line for this attraction will take four hours or more. Is it worth it? I think so. Luckily, being at the media preview meant I didn’t have to wait more than an hour. But I definitely would be willing to wait a pretty long time for another chance to soar on the back of a banshee. TravelingMom Tip: Entertainment along the line includes some subtle but important messages about conservation and the damage we can do with poor environmental management. I was traveling empty nest, but if the kids had been with me, I would have tried to use it as a launching pad for a conversation about the environment. 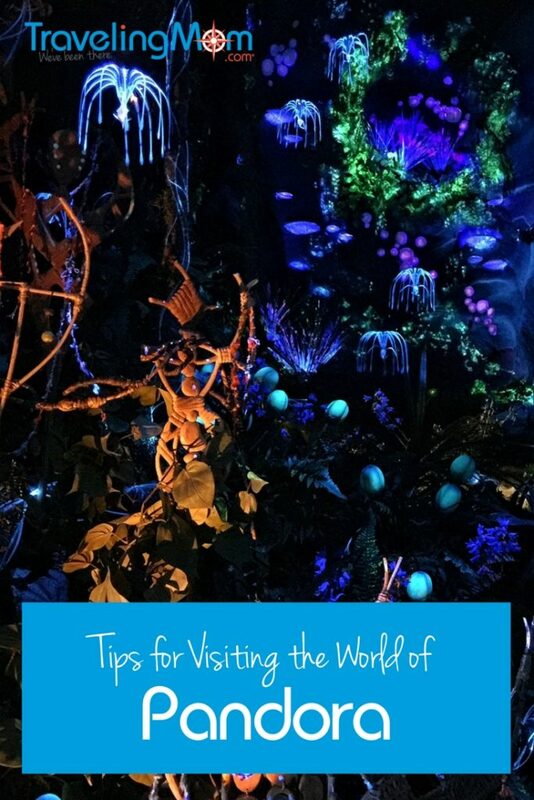 You can reinforce that real-life environmental message via the My Disney Experience app while you’re visiting Pandora. Engage is some environmental missions and unlock contributions to the Disney Conservation Fund. Then choose whether you want your contribution to help rebuild habitats for elephants, apes, butterflies, cranes, coral reefs, sea turtles, monkeys, rhinos, tigers, or sharks and rays. This ride has been likened to Soarin’. And it is, in terms of the mechanics of the ride—you’re stationary on a chair (or banshee) that moves, shakes, and appears to soar over breathtaking locations. But Flight of Passage is Soarin’ on steroids. The rush has definitely been ratcheted up. This one requires a repeat ride. The first time, sit back and enjoy the rush of the waterfall spray in your face, the breathing of the banshee against your legs, the smell of the Pandora wilderness. The second time, spend the ride looking around—up down, left, right. There is an entire world to see. TravelingMom Tip: The banshee is styled like a motorcycle. You straddle the seat, lean forward and grip the handles. Before the ride, your back and legs will be locked into place. If you’re not sitting in the right place, this can be quite uncomfortable. So, before the restraints move into place, make sure you are sitting up straight in the seat and your feet are all the way forward. If you happen to be leaning over to grip the handlebars (as I was on one ride), you can find yourself in a tight squeeze. Likewise, if your feet are too far back, the leg brace can put uncomfortable pressure on your calves. Several people complained the ride was uncomfortable. 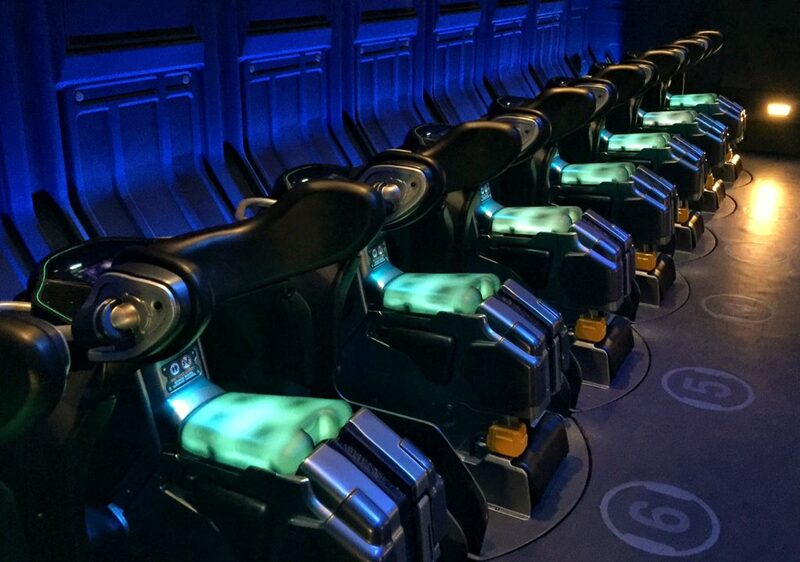 I forgot all about the tight fit once I started flying on my banshee, but I suspect Disney will end up modifying the banshee seats in the near future. So now we come to the thing that underwhelmed me at Pandora. Having seen the movie and ridden the rides, both of which are so richly imbued with bioluminescent beauty, I eagerly anticipated nightfall in Pandora. When the sun went down and the glow came up I was a little disappointed to see that it mostly was the sidewalk glowing with reflective paint. The gardens also emit a glow, much of it from the aforementioned bladder polyps. I was expecting Pandora-like glowing to the tops of the trees. 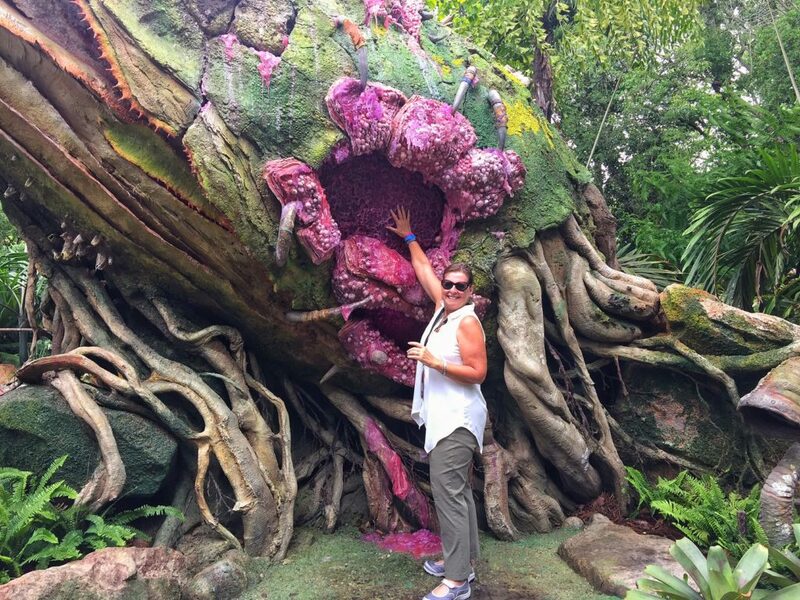 Missing that was what a friend called “anticippointment.” I anticipated the Pandora I was walking through would look very much like the Pandora I experienced on Flight of Passage. 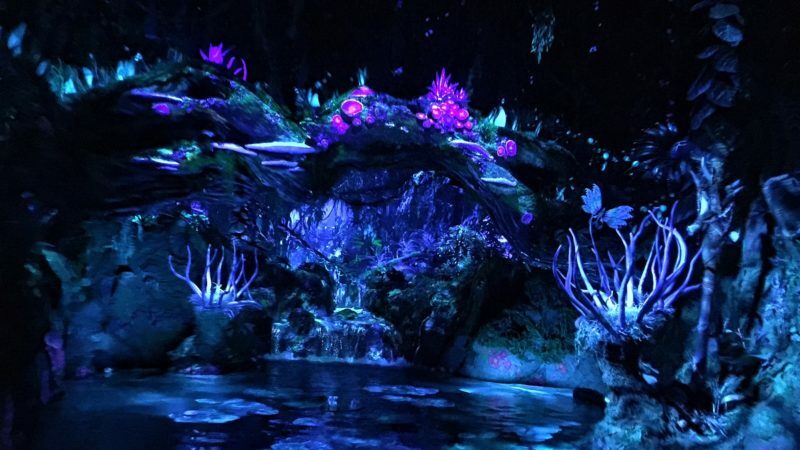 I suspect that Disney will up its bioluminescent game over the next few months. I wasn’t the only one who said they expected more. Hey. It’s Disney. The company sets the bar on magic and fantasy very high. We are trained to expect miracles! Get the TravelingDads’ perspective on Pandora, starting with drinking beer in the morning (although TravelingDad Editor Paul Eisenberg figures it’s probably 5pm on Pandora). Danielle Faust, named one of People.com's favorite mom instagrammers, is the mother of two semi-homeschooled preschoolers and is always on the go. The New York native now living in south Florida enjoys making memories around the world, marrying her husband in the canyons of Nevada, scuba diving with whale sharks in Mexico, climbing an active volcano in Guatemala, and "attempting" to surf in El Salvador. 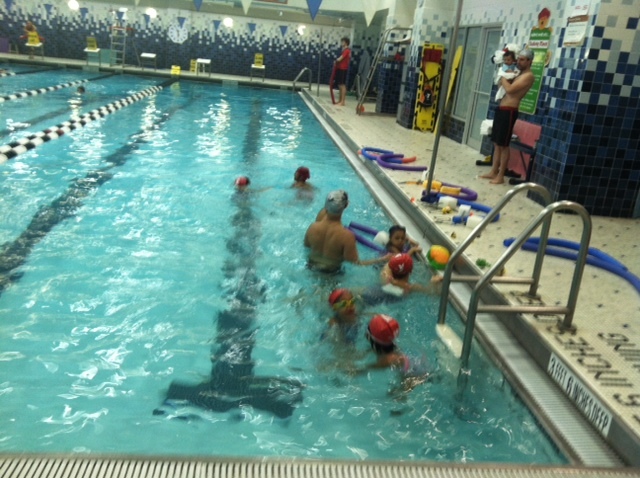 Dani enjoys mixing solo "momcations" and family vacations with active girls trips and romantic escapes with her husband. 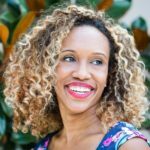 You can catch up with the certified life and wellness coach at her award-winning family lifestyle site, OKDani.com or her coaching site DanielleFaust.com. Otherwise Dani can be found at the gym, researching her next travel adventure, trying to figure out her DSLR... or seeking out coffee. Is there a height restriction on the two rides? Yes. My younger 5 year old cousin could not go on flight of passage because of his height.